It’s amazing what a difference an episode makes. After last week overloaded on plot and under-delivered on almost everything else, “Conspiracy Weary” manages to almost completely get the season back on track. Yes, there’s still a lot going on here, but it’s parceled out here into well-paced, manageable chunks that do a lot of legwork moving along the season’s storylines while simultaneously being extremely entertaining. Once again the episode essentially abandons the case of the week structure, turning the weekly brain into a way to advance the zombie vs. human plot instead. The show left off last week with Don E chained up, a gun to Ravi’s head, and Liv and Blaine outside ready to rescue them. It was a bit of a failed cliffhanger then, but the continuation of the scene makes for very satisfying events to open this episode. 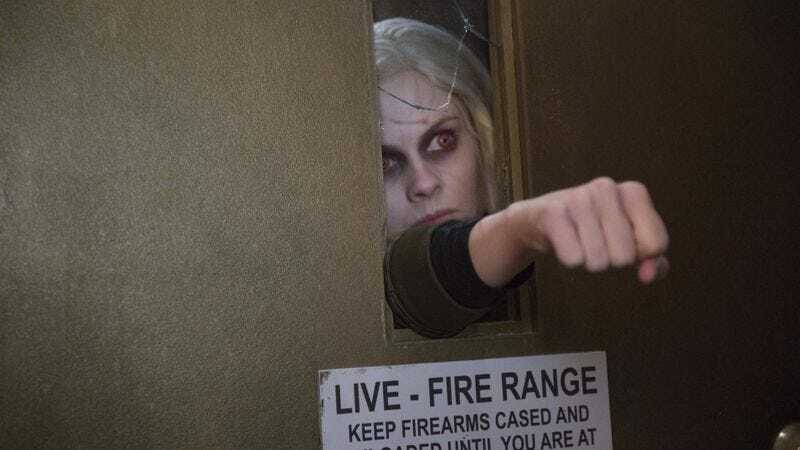 iZombie only pulls out big action sequences a few times a season, so when they do they are generally a great time and that is again the case. The fight scene also gives them a chance to show both Liv and Blaine in full-on zombie mode, the intricacies of which remain confusing but always at least looks extremely cool. What works best about the open it is not just the action sequence, but also the way the scene builds and builds until almost every character is involved. In a show with so many sprawling stories, whenever they have the chance to converge it’s always welcome. Considering that Fillmore Graves was introduced as a big zombie presence as early as the season premiere they haven’t had more than an intermittent importance to Liv’s actual life, so to see their presence tick up as the episodes tick toward the finale works to finally make their presence in the plot feel a bit more important (if still not making it clear exactly what it’s all leading to). The opening sequence also kicks off the episode’s stories for almost everyone except Peyton and Major, which makes following so many storylines a lot easier. The attack on the truthers leads Blaine, Don E, and Liv to eat Harley Johns’ brother’s brain, and both the attack and that brain become the seeds that feed the rest of the episode. Liv spends her time hopped up on paranoid conspiracy theories, and her paranoid visions (along with some traditional detective work from Peyton and Clive) lead them to figuring out that there’s definitely some sort of zombie presence behind the Weckler murder case and subsequent cover up, and it’s likely there is some other kind of conspiracy (or perhaps the same one?) setting up Harley Johns and his truther group to take the fall for both the DA Baracus assassination attempt and Wally’s murder. That’s a lot of conspiracies at one time, so I hope they are at least somehow related. Liv and Peyton’s big theory for the Weckler conspiracy is that DA Baracus is behind it all, which is inconvenient timing considering he was just elected mayor. A more pressing issue stemming from the opening sequence is that Ravi’s truther friend Rachel witnesses it all, and it turns out she’s not a random curious photographer but a reporter for the local alt-weekly. Once Ravi reveals everything about the story to her, she turns around and gets it all published on the front page—complete with an angry, zombie-faced Liv on the cover. 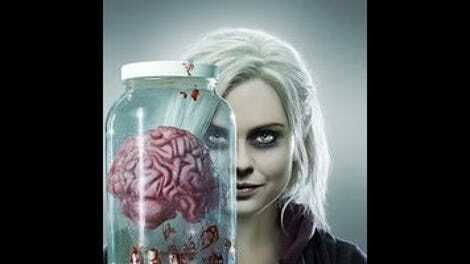 This is the first thing in the zombie vs. human conflict that feels like it has the chance to get some actual traction in the human world, unless Fillmore Graves can successfully run a disinformation campaign against it like they did for the truthers’ live feed of Don E. It’s unclear whether or not iZombie actually fully lives in today’s “fake news” political reality, so who knows how it will be received. Either way, Ravi has not had very good luck with the ladies this season. Also not having very good luck with the ladies is Major, as his plot with Shawna ends exactly how we all predicted it would end. While it was nice to see Major happy for a few episodes, it was so obviously going to end with his devastation that you couldn’t ever really settle into that happiness. The only quibble I have is that her last scene, where she pleads that she was trying to help him and not capitalize on his infamy, is so easily read in a complicated way that having the t-shirts show up at the end ruins a bit of that complexity. The people around Major repeatedly call her crazy, but there was real potential there to have her not coded as crazy—but instead more misguided—that having people use her pictures to sell t-shirts ruins a bit. (I assume it wasn’t actually Shawna selling the shirts, but vendors pulling her pics off of tumblr.) In the end, though, an inevitable ending inevitably played out, and left Major even more depressed about his life than he was when it started. Yay? At least this was the lone shaky spot in what was otherwise a very solid episode. One thing that confused me was the text Liv sent to Justin and Major. Weren’t Chase’s orders to keep their raid on the cabin a secret from Liv and the police department? If so, how did she know to text them a warning? So Harley is a zombie now. Is he going to put himself down or give in to eating brains? Will he want to expose his own kind? I guess the answer to whether or not zombies who are trying to pass get the spray tan everywhere was definitively answered. Thank you for your sacrifice in helping us answer this burning question, Mr. Dohring. Three-way visions are a delight and need to happen more often. Tom Cruise: Zombie, or no?